A display has arranged on a new prototype car at the New York International Auto Show. This car is licensed to drive as well as fly- news of BBC. This media said US Company “Terrafugia” has arranged the display of prototype car. It is said that this is the first vehicle on earth who have met both the standards of the FAA (Federal Aviation Administration) and the NHTSA (National Highway Traffic Safety Administration).To drive on street it is needed to have permission from NHTSA & for flying from FAA. For the first time this “flying car” got both the permission. 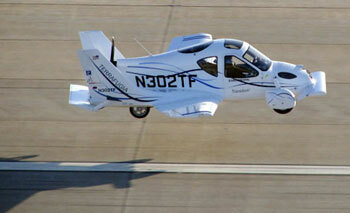 This makes it the first "street legal aeroplane" said Cliff Allen, vice-president of sales at Terrafugia. BBC said that the versatile vehicle has two seats, four wheels and retractable wings.